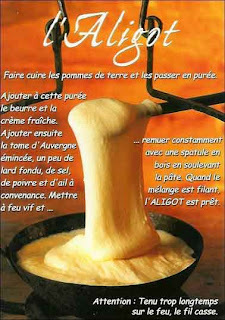 In the 1ere arrondissement in Paris stands a brasserie, Chez Flottes, that offers good reasonably-priced traditional food and specialities from south-west of France, including aligot, a comforting combination of mashed potato with Tomme or Cantal cheese, garlic and butter. It's easy to make at home and now that cooler weather is coming I can contemplate a plate of cheesy mash. Peel and boil a couple pounds of baking potatoes, drain, return to a low heat and mash with half a stick of butter and a good tablespoon or so of cream or creme fraiche, Stir in one finely chopped garlic clove and 8 oz of Cantal, tomme de Savoie or sharp cheddar cut into tiny cubes. Season with salt and pepper. The secret is to have enough heat to melt the cheese but not to overcook the mixture. Pull the spoon up out of the pot as you stir. As soon as the mix becomes glossy and forms big strands pour it into a serving dish. You can serve it with pretty much any well-flavoured meat, Confit de canard, pavé de boeuf or sausages. It would also work as a base for a filet of firm white fish such as cod, haddock or monkfish. If it's done right and you like mashed potatoes and fondue you'll love this hearty dish, cooked too long and it's like glue & sits in your stomach like the hills of the Auvergne.